I’m excited to say that the new film I made with Mike Birbiglia opens this weekend in New York, and all over the country in the next few weeks. It's a comedy called Don't Think Twice. It’s been amazing to see Mike grow as a writer-director since our first film Sleepwalk with Me. Leonard Maltin’s review says that this is his Annie Hall—"a coming-of-age for him as a true cinematic storyteller”—and I really agree. The film’s about what it’s like to watch your best friends get way more success than you. It’s about a group of improv comedians who’ve worked together closely for years and love each other; then two of them are asked to audition for a show that’s a lot like Saturday Night Live. It wreaks havoc on their friendships. People have to decide whether to quit comedy and get normal jobs. Which is to say: it’s a really funny and very REAL movie about failure. 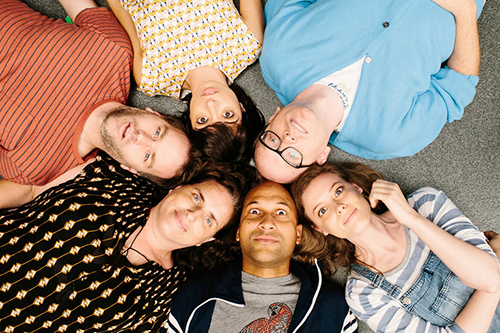 It stars Keegan-Michael Key (from Key and Peele), Gillian Jacobs (from Community and Love and Girls) and Kate Micucci from Garfunkel and Oates, plus Chris Gethard and Tami Sagher who have been on our show a bunch. Oh! And Birbiglia. We’re scoring an incredible 100 on Rotten Tomatoes. Very important: THIS WEEKEND Mike and I are doing 30 Q&As at screenings in New York. We’re doing so many because apparently other theaters will pick up the film if they see good numbers for this opening weekend. If you’re in NYC and thinking about coming to the film, it would help us a lot if you’d do it THIS WEEKEND. Come and see us in person! It’ll be fun! Tickets here. Next weekend I’m doing the same thing in Chicago and Mike and the cast do Q&As in LA. Upcoming Q&As in Denver, Portland and Seattle. I’m really proud of the film. It’s sad and funny and not like many other movies.